Sometimes accessibility is about making small changes that bring about a big impact in people’s lives. Take the act of flipping the pages in a book. This is probably an action most of us take for granted. For some people with motor challenges, though, the ability to flip the pages of a book is the difference between being able to enjoy a favorite book or being locked out of that experience. In the past, the only way to accomplish this action (flipping the page of a book) was through the use of a cumbersome mechanical device. My friend and colleague Christopher Hills illustrates the use of such a device in a short YouTube video. Description: As dramatic music plays, the video begins with the words “In the not too distant past…” then cuts to Christopher sitting in his powered wheelchair while a relative reads a book next to him. As Christopher looks on, his dad Garry brings in a large, industrial looking device that needs to be wheeled into the room. Garry proceeds to plug in the device and place a book on it. An external switch box has options for the various page flip actions. Christopher flips the pages of the book with this device, which uses a roller to turn the pages each time Christopher presses a head mounted switch that is connected to the external switch box. The video then cuts to “Now…” and we see the same relative as in the opening scene sitting down at the kitchen table with his iPad, ready to read a book. With an over the shoulder shot, we see the relative turn the pages on his iPad as Christopher performs the same action next to him by pressing a head mounted switch that is connected to his iPad via Switch Control. With digital content and assistive technology, the cumbersome, mechanical device shown in Christopher’s video is no longer needed. Devices like the iPad now include built-in switch access (Switch Control) that can be combined with external switches to make flipping the pages of a book a much simpler task. In the embedded video, I demonstrate the use of Recipes to flip the pages of a book I created with the Book Creator app on my iPad. The book is I Am More Powerful Than You Think. Want to learn more about Recipes and Switch Control? You should check out a free book I co-authored with Christopher Hills – Handsfree: Mastering Switch Control on iOS . This interactive book has more than 20 closed captioned videos that go over every aspect of using Switch Control – from how to connect a switch interface to your iOS device, to how to control your Apple TV with a switch. It’s that time of the year again. The supplies and textbooks have come in. The room is decorated. Soon students will be walking through the door and it’s off the races. A new school year is upon us. If you are lucky, you have a classroom set of iPads, or you may be in a BYOD situation where students are bringing their devices to school. Did you know about some of the features built into the iPad and other iOS devices that can help you empower all learners to access the curriculum this year? No? Well that’s what this post is about. You don’t need to have any students with IEPs or Section 504 plans to take advantage of these features. They are called universal design features because they can benefit any of a number of learners. Here are the top seven. Yes, I know that’s not a real word (except maybe on The Simpsons) but it means to make the text larger. On iOS devices, this is easy to do and by making the text bigger you will allow your learners to focus all of their energy on understanding the content rather than squinting and struggling to see it. To make the text larger, go to Settings > Display and Brightness > Text Size and use the slider to adjust the size as needed. Not big enough? No problem. Go to General > Accessibility > Larger Text instead. There you can turn on even Larger Accessibility Sizes. While you are it you may as well turn on Bold Text to make that text really stand out. Well at least to you…your students probably don’t know what a negative from the film days is, seeing as the only photos they look at are probably on Instagram or Facebook. In any case, reading on screen can be very tiring for our eyes, with all that light coming at us from the screen. As our leaners spend more of the day in front of the screen one thing we can do is reverse the colors to help with eye strain. It’s really simple to turn this feature on and off, so why not try it. If it doesn’t work you can easily go back to the default black on white scheme. 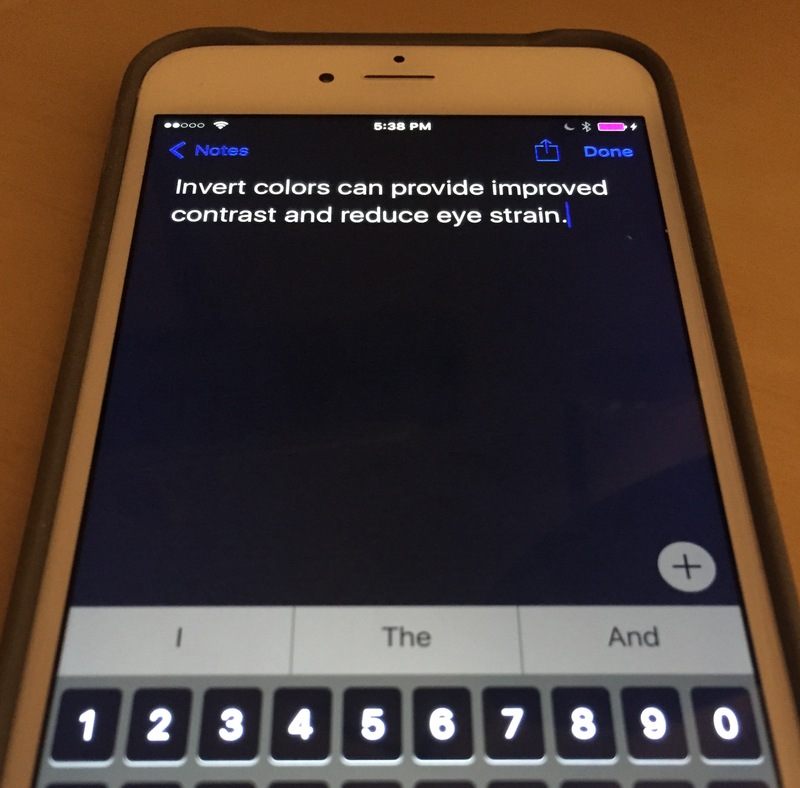 Invert colors can be found under Settings > General > Accessibility, or even better just use Siri to turn this feature on/off by saying “Turn on Invert Colors.” The kids will love that trick. Alex is not a person, though if you spend some time listening to him reading content on the iPad you may begin to think he is. Alex is the built-in high quality voice that has been available on the Mac for a number of years. Guess what? Now it’s available as a download for use with the text to speech feature built into iOS, officially called Speak Selection. This feature can even highlight the words as it reads them aloud, which can be a big help to some struggling readers. The video explains Speak Selection in more detail. Speak Selection works great with the Reader feature built into Safari, which removes ads and other distractions from the page. 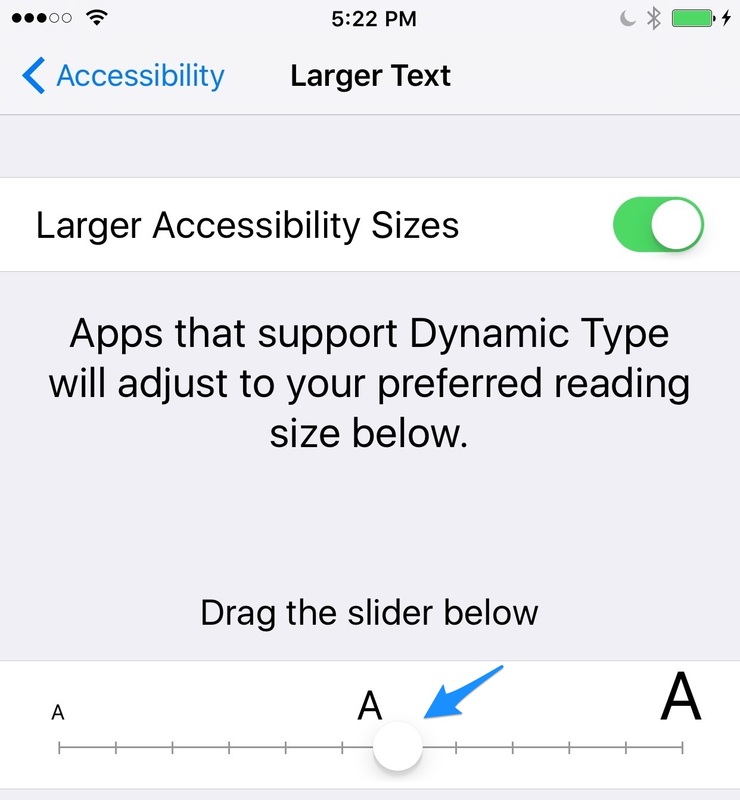 In the upcoming iOS 9 release the Reader feature gains controls for adjusting the text size as well as changing the background and font for even better legibility. Don’t want to select the text first? No problem. Speak Screen is activated with a special two finger gesture and will read everything that is on the screen (and I do mean everything). Once you turn on Speak Screen in the Speech settings, you can perform a two-finger swipe from the top of the screen (except on the Home screen) to hear everything read aloud. Even better, have Siri help out. Just say “Speak Screen” and it will start reading. You even get an onscreen controller for adjusting the speaking speed. Although it is not technically an accessibility feature, the word prediction built into iOS 8 (QuickType) can be a big help for learners who struggle with spelling or just have a hard time producing text. This feature should be turned on by default but if not you can enable it by going to Settings > General > Keyboard and making sure Predictive is turned on. When you start typing a word, suggestions should pop up in a strip just above the onscreen keyboard. 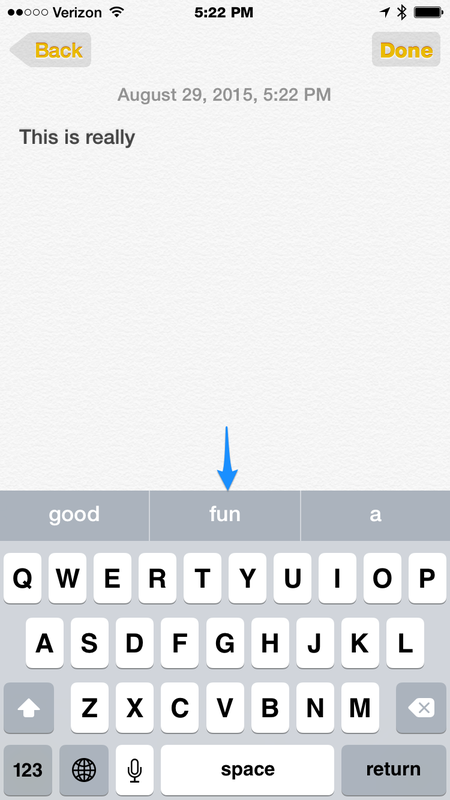 Say it with me…Dictation is awesome. It also stands for closed captioning, a feature that is built into many videos for those who are unable to hear the audio. Closed captions can benefit a number of other leaners: English language learners, struggling readers, and anyone learning a topic with specialized vocabulary where seeing the words as well as hearing them could be helpful (science, for example). And as a bonus you will have a fallback for when your speakers just don’t work (because technology never fails, right?). You can enable the captions for a video that has them by going to Settings > General > Accessibility and choosing Subtitles & Captioning. You can even change the appearance of the captions to make them easier to read. Have an Apple TV in your classroom? It too has support for captions. Just go to Settings > General > Accessibility > Closed Captions + SDH to turn them on. Just as with your iOS device, you can change the appearance of the captions on Apple TV. There you have it. A few more things to have in your tool belt as you work to ensure access to learning for all of your students this year, which I hope will be a great one! As I was traveling to Macworld 2013, where I presented a session on iBooks Author, I had some time when I was trapped on a plane without Wi-Fi (the horror!). Rather than reading the magazine in front of me, I gave into my urge to try to combine two frameworks I am really passionate about, the SAMR model developed by Dr. Ruben Puentadura and the UDL framework developed by CAST. 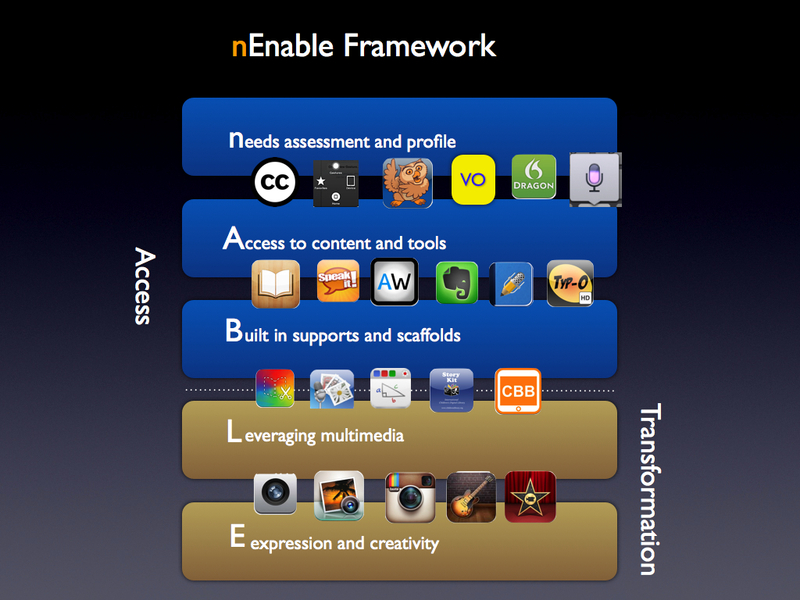 Below is an image showing the framework I developed and some apps that address each level. This was just a quick brainstorm on a long plane ride, but I do appreciate your feedback. determine current level of performance and desired outcomes. 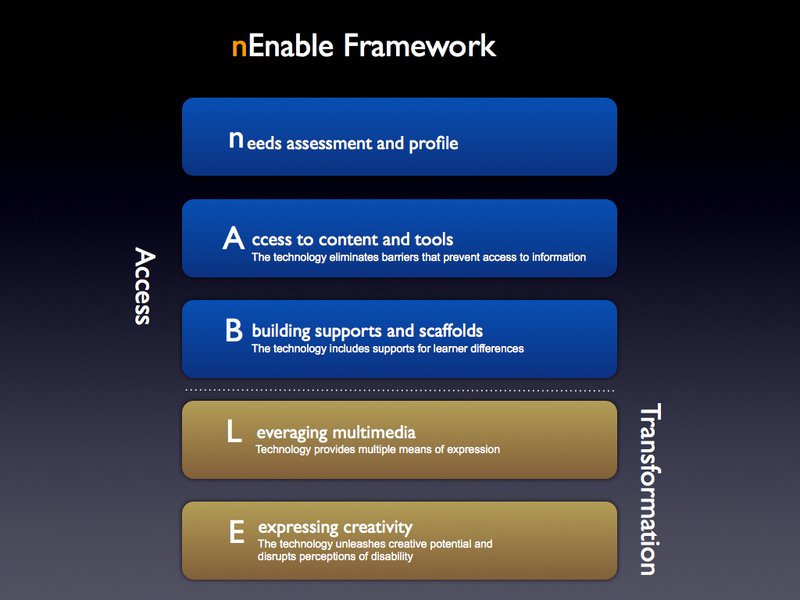 The technology includes scaffolds and supports that account for learner differences. The technology provides multiple means of expression. The technology unleashes creative potential and disrupts perceptions of disability. VoiceOver enhancements: IOS 5 includes an updated voice for VoiceOver, the built-in screen reader for people who have visual disabilities. I have found the new voice to be a great improvement over the old one, especially when reading long passages of text in apps such as iBooks. 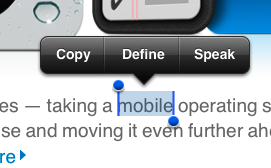 Another improvement is that the triple-click home option is set to toggle VoiceOver by default. Along with the PC-free setup introduced with IOS 5, this small change has made it possible for someone with a visual disability to independently configure his or her IOS device out of the box, without any help from a sighted person. The Mac-cessibility website has an excellent overview of the many new changes in VoiceOver that I highly recommend reading. Camera app compatibility with VoiceOver: this is a neat feature that will make photography more accessible to people with low vision and those who are blind. With VoiceOver on, if you launch the Camera app it will announce how many faces are in the frame. In my testing this worked pretty well, and I’ve used it successfully on the iPad and the iPod touch. It should work even better on the iPhone, which has a better sensor and optics. Combined with the ability to turn on the camera app from the lock screen on some devices (iPhone and iPod touch) by double-tapping the home button and the fact that you can use the volume up button as a shutter release, Apple has done a lot to make photography more accessible to people with visual disabilities. Speak selection (text to speech): This is one of my favorite features introduced with IOS 5. It provides another modality for students with learning disabilities who can benefit from hearing the text read aloud to them. To use it, go into Settings, General, Accessibility, tap Speak Selection and choose On. Once you’ve enabled this feature, when you select text a popup will show the option to Speak the text using the VoiceOver voice. Note that you can control the speaking rate for the speak selection feature independently from VoiceOver. Balance controls for audio: In addition to mono-audio, which combines both channels of stereo audio into a single mono channel, there is now an option for controlling the left/right balance for stereo sound. On the iPhone, there is now also a special Hearing Aid mode that is supposed to make the device more compatible with hearing aids. Handling of incoming calls: you can choose to automatically route incoming calls to the speaker phone feature of the phone, or to a headset. New alert types: on the iPhone, you can use one of five unique vibration patterns to identify who is calling if you have a hearing disability, or you can create your own pattern by tapping it on the screen. These custom vibration patterns can be assigned in the Contacts app by opening a contact’s information, choosing Edit, Vibration and then Create New Vibration. There is also an option to have the LED flash go off when you get a notification, a new message, and so on. Assistive touch: this was one of the most anticipated accessibility features in IOS 5. Assistive touch was designed to make IOS devices easier to use for people with motor difficulties. For example, someone who is not able to tap the Home button to exit an app can now bring up an overlay menu with icons for many of the hardware functions of their device, including the Home button. Assistive touch also includes options allowing for single finger use of many of the multi-touch gestures (including the new four finger gestures available only for the iPad and the pinch gesture used for zooming). To use assistive touch, choose Settings, General, Accessibility and turn on Assistive Touch. You will know assistive touch is enabled when you see a floating circular icon on the screen. Tapping this icon will open the overlay menu with the assistive touch options. Note that you can move the assistive touch icon to another area of the screen if it gets in the way. Please note that Assistive Touch is not compatible with VoiceOver. I really wish the two features could work in tandem. This would be helpful to users with multiple disabilities. 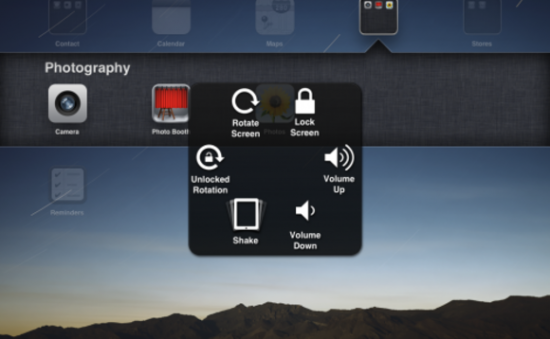 Custom gestures: assistive touch includes an option to create your own gestures. Update: I was able to create a few useful gestures after watching this video from Cult of Mac. I created one for scrolling up on a page and one for scrolling down. Now when I’m reading a long web page, instead of having to swipe up or down to scroll I can bring up the assistive touch overlay menu, select the new gesture from the Favorites group and tap once on the screen to scroll. Typing shortcuts: under Settings, General, Keyboard you can create shortcuts for common phrases. For example, you could create a shortcut that would enable you to enter an email signature by simply typing the letters “sig” and pressing the space bar. This feature should provide a big productivity boost to anyone who has difficulty entering text on their mobile device. Siri and dictation (iPhone 4S only): the new personal assistant uses voice recognition and artificial intelligence to respond to a range of user queries that can be made using everyday language rather than preset commands. The Apple website has a video that demos some of the capabilities of Siri. One of the amazing things about Siri is that it works without any training from the user. Along with Siri, the iPhone 4S also includes an option to dictate text by tapping a microphone button on the keyboard. The ability to use your voice to control the device can be helpful to many different types of disabilities, including those who have disabilities that make it difficult to input text. One of the things I have found especially frustrating when using VoiceOver on IOS devices is inputting text, so I hope this new dictation feature makes that easier. I will have a chance to test it out more thoroughly once I get my own iPhone 4S (currently out of stock in my area). Update: I finally got my hands on an iPhone 4 and I tried using the dictation feature with VoiceOver. It is working really well for me. 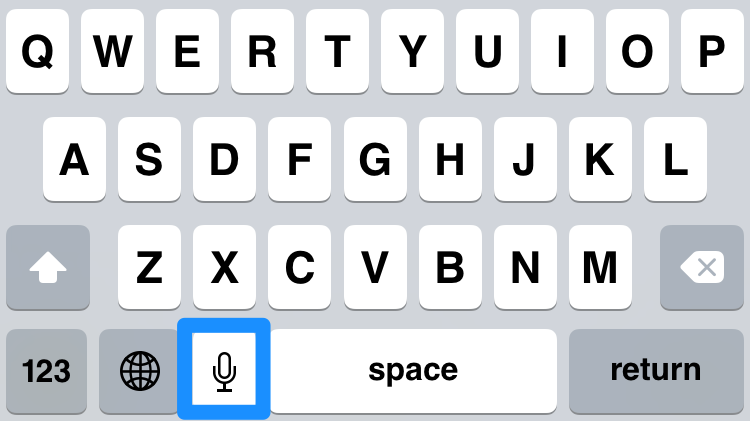 I find the microphone button on the onscreen keyboard by moving my finger over it, double-tap to start dictation (as indicated by a tone) and then I double-tap with two fingers to stop it. Even better, after I’m done dictating the text, if I move the phone away from my mouth, it automatically stops listening! I love this feature. Dictionary: While it is not listed as an accessibility feature, having a system dictionary is a new feature that is great for providing additional language supports to students with learning disabilities. To use this feature, select a word and a popup will show the Define option that will allow you to look it up using the same dictionary that has been previously available only in iBooks. iMessages: a new add-on for the Messages app makes it possible to send free MMS messages to any owner of an IOS device. Many people with hearing disabilities rely on text messaging as a convenient means of communication. The iMessages will be especially helpful to those who are on a limited text messaging plan. Reminders app: The new Reminders app has a simple interface that will make it a nice app for people who need help with keeping track of assignments and other tasks. On the iPhone 4 or iPhone 4S, tasks can be tied to a location using the phone’s GPS capabilities. One use of this feature could be to set up a reminder for a person to take their medication when they get to a specific location, for example. Airplay mirroring (iPad 2, requires an Apple TV): along with IOS 5, a recent firmware update for the Apple TV enables mirroring to a projector or TV using Airplay. I can see this option being helpful in a class where there are students in wheelchairs who have difficulty moving around the room. Using air mirroring, the teacher could bring the iPad 2 to the student and the rest of the class could still see what is displayed by the projector or TV. The new accessibility features make IOS 5 a must-have update for anyone who has a disability, as well as for those who work with individuals with disabilities. For schools and other educational institutions, the accessibility features of IOS make Apple mobile devices an ideal choice for implementing mobile learning while complying with legal requirements such as Section 504, Section 508 and the Americans with Disabilities Act. Disclosure: I am an Apple Distinguished Educator.